After all the crap you have heard from this Trump, don't you just want to punch him in the face? While it's time to do that. 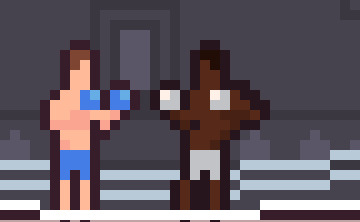 Punch the Trump is a classic boxing game where you can hit Donald and express your emotion within the legal limit, use Z or M to hit quick and X/N to punch heavily, remember to block the hit with space key for he can fight back as well enjoy and just let your concern go, beat the crap out of him!! You can play Punch The Trump free online shooting games at fogames. It has tags: Action,Boxing,Donald Trump. It has 5079 total plays and has been rated 91.8% (77 like and 20 dislike), find the fun and happy day. If you want to play more shooting games, we find some of the game: Super Duck Punch, Donald Trump Collect Dollars, 4096 Punch and Beat Up Trump. To play other games, go to the action games page, the boxing games page, or just check out the new games or best games page. Play Punch The Trump online games, Fun and Happy.